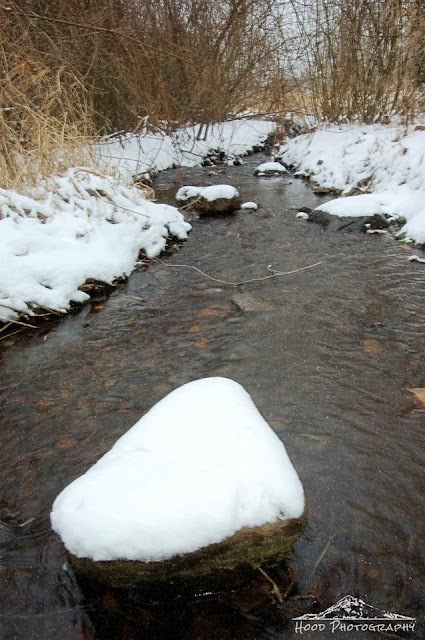 This is Arata Creek, which flows through Wood Village, taken on January 8th during our brief 'Snowpocalypse'. I had ventured out before the freezing rain hit to take some photos of the fluffy powder that had dusted over the landscape. I wore my rubber boots, and was glad because wading into the small creek to get this view was easy! Great capture with the snow covered rock in the middle. It's a lovely creek in the snow! Wow looks like you have a lot of snow there too!